Under the contract, IBS will implement its award-winning cargo management solution, iCargo, to manage the end-to-end cargo business functions of Korean Air. With the implementation, Korean Air will migrate from its existing legacy core system and a multitude of satellite systems, to a fully integrated new-generation platform. The iCargo system will place the full scope of business operations of Korean Air – reservation, sales, terminal operations management and revenue accounting – into a single integrated platform. 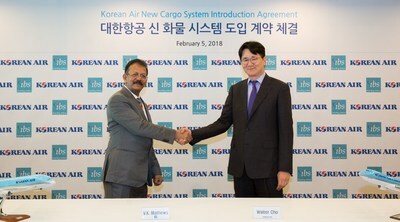 This will enable Korean Air to upgrade several value-adding capabilities in various areas, such as revenue and yield management, product management, real time shipment monitoring and control, and advanced technology capabilities like enterprise mobility, to elevate its cargo business and operations to a much higher level of efficiency. The iCargo platform will also enable Korean Air to align itself to industry-driven standards and best practices such as eAWB and CXML. Korean Air owns 161 aircrafts and operates scheduled flights to 123 cities in 43 countries worldwide, including 13 cities in Korea. IBS' highly modular iCargo solution supports all the IT needs of air cargo management in a single, fully integrated platform and can be tailored to suit specific customer needs and priorities. Capable of addressing the needs of all kinds of cargo operations – large or small, combination or pure freighter, LCC or full service – iCargo powers the cargo movements of nearly 30 leading airlines across the globe, making it the leading cargo management solution for the air transportation industry. A winner of several industry awards, iCargo solution was selected as the “Airline Product Innovation of the Year 2015” by CAPA – Centre for Aviation.